Can a wheelchair pose a threat? Does menace lie in a bunk bed? Is there a hidden agenda lurking in a kitchen — as an ominous electric buzz humming through chairs and tables suggests? In the art of Mona Hatoum, the familiar can be disorienting and unsettling, challenging our assumptions and upending our expectations. “Terra Infirma,” an exhibition on view at the Pulitzer Arts Foundation in St. Louis through Aug. 11, spans the four-decade career of the Palestinian multimedia and installation artist. The retrospective, which debuted last year at the Menil Collection in Houston, features more than 30 works culled from American and European collections and is her first major solo show in the U.S. in 20 years. “Terra Infirma” ranges from politically-tinged pieces that are characteristic of Hatoum’s early career to more recent ones that reflect the influence of surrealism and minimalism on her work. Museumgoers may be particularly intrigued by her focus on household objects. 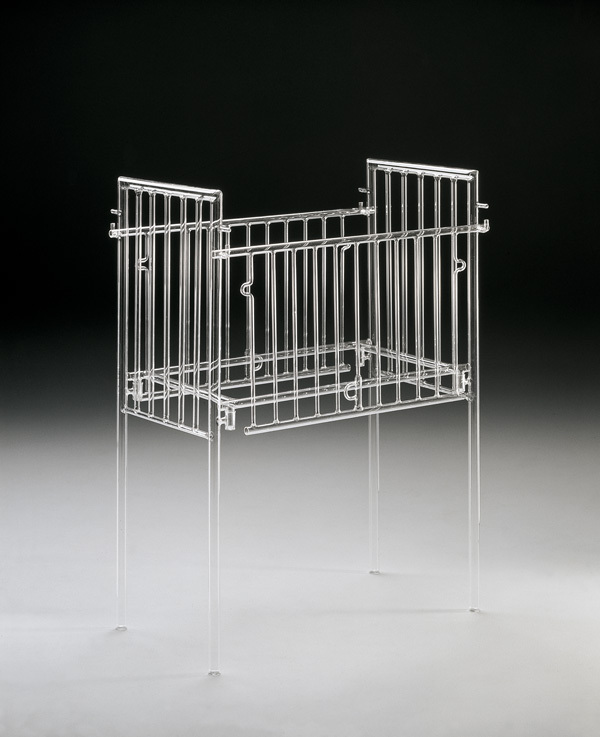 Hatoum’s solo exhibition represents the first time the Pulitzer has mounted a show originated at another museum. “Terra Infirma” has been tweaked slightly to accommodate differences in layout between the Pulitzer and the Menil. 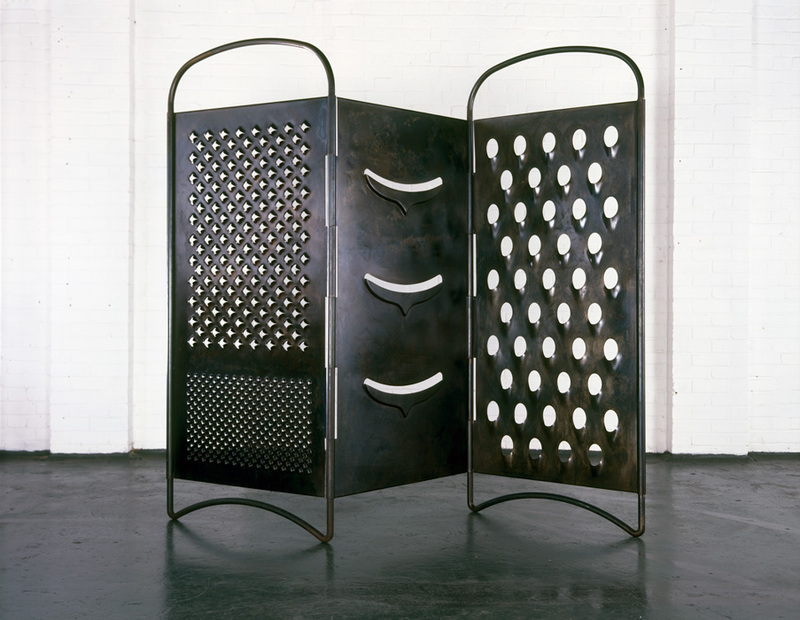 Hatoum cites Cubist painter Marcel Duchamp, surrealist artist René Magritte and post-minimalist sculptor Eva Hesse as important influences on her work. “I really related to Duchamp’s mental games, if you like — especially the way he titles his work, but also the conceptual aspect of his work,” she said. “When I discovered Duchamp, it was like I never looked back. “Terra Infirma” immediately puts museumgoers on notice that they’re in for a unique experience with “So much I want to say” (1983), a black-and-white video installed near the Pulitzer’s entrance. In a succession of still images, a young woman (Hatoum) repeats the title phrase in a trancelike monotone. She’s framed in close-up, and in each image her mouth is covered by a pair of male hands. The piece is a stark commentary on censorship. A cycle of creation and destruction is represented in Hatoum’s “+ and -” (1994-2004), in which a motorized apparatus continually reshapes a circular bed of sand. As with many of her pieces, it offers the chance to contemplate a seemingly straightforward phenomenon — the shifting of sand as it yields to a force acting on it — with fresh eyes. 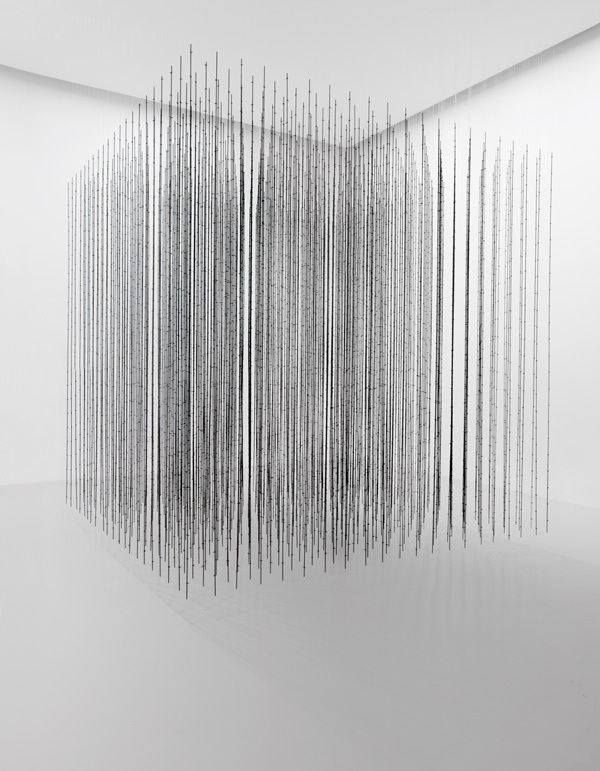 “Impenetrable” (2009) consists of more than 400 hanging barbed-wire rods that form a suspended cube. One of the artist’s most aesthetically beautiful pieces, it’s also one of her most socio-politically evocative: The barbed wire brings to mind the barriers that prevent refugees from crossing borders. The title has a double meaning: Not only are museumgoers restricted to looking at the piece rather than being able to move through it, but its relationship to them is similar to what it represents. The threat posed by “Untitled (Wheelchair II)” (1999) turns on a nasty detail — instead of handles with which to maneuver it, this wheelchair has knives. But that detail might easily be overlooked until injury has already been incurred. The stacked metal structures of “Quarters” (1996) might be interpreted as bunk beds, but they might also bring to mind the nondescript sleeping units found in dormitories, shelters, barracks or prisons. Sleeping quarters for soldiers, prisoners, homeless people and even students are as much about convenience as about comfort. And such quarters tend to be more conducive to conformity than individuality. The sound of electricity is a key element of “Homebound” (2000), in which a kitchen is rendered as fraught with tension as a battleground. Far from being a place to enjoy a cup of coffee and French toast, or an early-morning chat, it’s a zone of paranoia, disquiet and potential danger. Hatoum has also had solo exhibitions at prominent art institutions including the New Museum of Contemporary Art in New York, the Museum of Contemporary Art in Chicago, the Institute of Contemporary Art in Boston, Centre Pompidou in Paris, and Tate Modern and Tate Britain in London. The London-based artist was born to Palestinian parents in Beirut, Lebanon. As a child, Hatoum was attracted to art. Her interest in drawing led her to study graphic design and briefly work at an advertising agency. In 1975, Hatoum was on a trip to London when war broke out in Lebanon. In exile, she studied for six years at the city’s Byam Shaw School of Art and Slade School of Fine Art. It was also in London that she became interested in a theme that she was to address in her work, and has become of increasing concern to the public at large: surveillance. “Terra Infirma” is well named, capturing the paranoia but also the poetry of contemporary times. The exhibition is a fascinating overview of a body of work informed by Hatoum’s acute observations of the world. The exhibition brilliantly traces her arc from explicit to implicit political engagement. “I’ve always known that I wanted to do something to do with art,” Hatoum said. 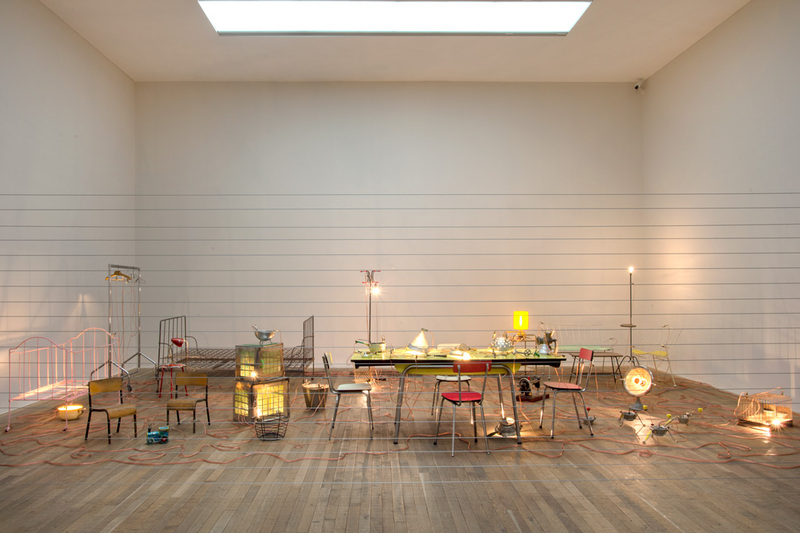 “Mona Hatoum: Terra Infirma” continues through Aug. 11 at the Pulitzer Arts Foundation, 3716 Washington Blvd., St. Louis. Hours are 10 a.m. to 5 p.m. Wednesday, Thursday and Saturday and 10 a.m. to 8 p.m. Friday. Admission is free. For more information, 314.754.1850 or www.pulitzerarts.org.